One of the most legendary rockers of all time has been added to the lineup of the 2019 edition of the Rock Legends Cruise — The Who‘s Roger Daltrey. Daltrey joins a bill already featuring Kansas, Kinks guitarist Dave Davies, Foghat, blues great Buddy Guy, The Outlaws, Nazareth, Canned Heat, ex-Jethro Tull guitarist Martin Barre and former Lynyrd Skynyrd drummer Artimus Pyle. The Rock Legends Cruise VII is scheduled to set sail on February 14 from Fort Lauderdale, Florida, and will travel to Costa Maya, Mexico, before returning to port on February 18. Cabins for the 2018 cruise are almost sold out, while the ones that are still available can be reserved by visiting RockLegendsCruise.com. As previously announced, Daltrey will be playing four solo shows in March in Las Vegas and California, and then will be mounting a U.S. tour in June and July that will feature him performing The Who’s classic 1969 rock opera Tommy with orchestral accompaniment. Great Story. I am interested in watching and listening stories. I use Kodi Exodus software where you can find many varieties of videos and this contains a very good searching technique. 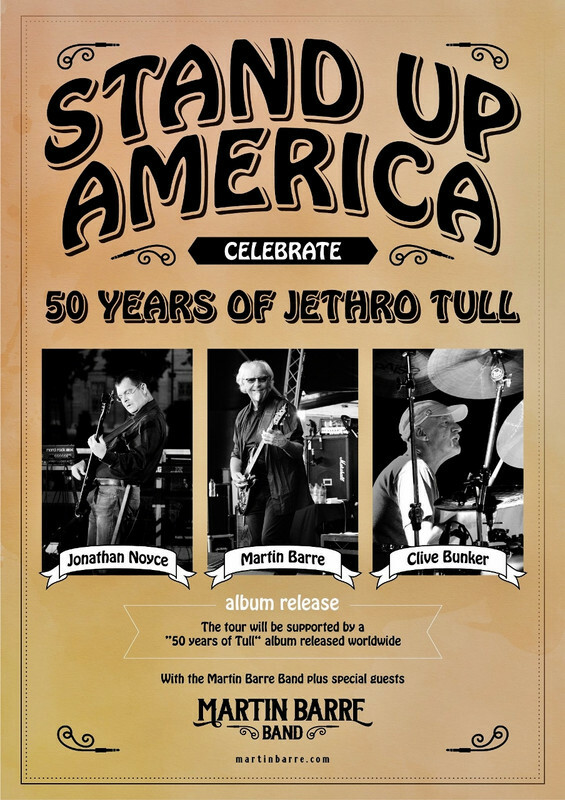 Martin’s launching his own ‘Jethro Tull 50th Anniversary Tour’! The population of Northerners who’ve moved to Sarasota now includes a national music festival. The 16th annual Rites of Spring Festival, or RoSfest, will take place for the first time at Sarasota Opera House from May 3 to May 5. The progressive music festival has spent the past 15 years in various Pennsylvania cities. Festival founder George Roldan and marketing and design head Beth Wilson, his wife, moved to Sarasota in September. 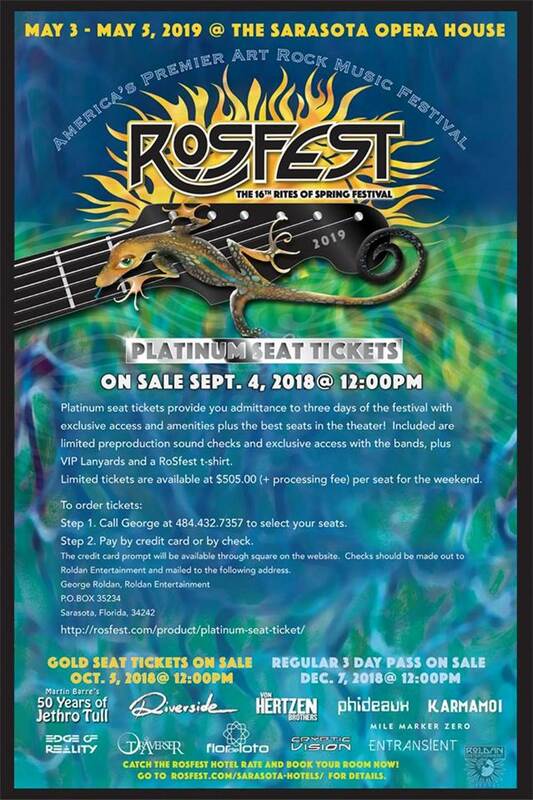 That led them to move RoSfest, along with the idea that a tourism destination like Sarasota could appeal to the festival’s largely out-of-town audience, which can come from as far away as Europe. 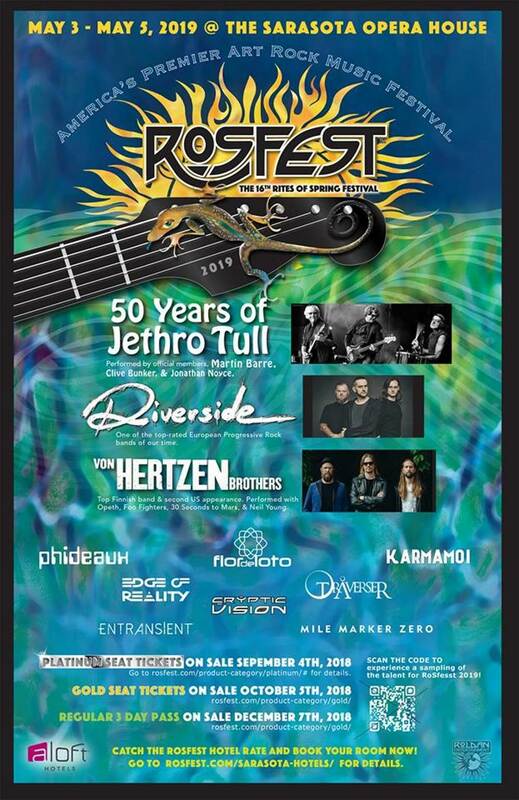 The musical headliners include a version of British prog-rock band Jethro Tull featuring original drummer Clive Bunker, longtime guitarist Martin Barre and bassist Jonathan Noyce, who played with the group from 1995 to 2007. There will be two other headliners, as well as other local, national and international acts. Still that's a neato lineup! He was always a little behind, still has time to catch up. 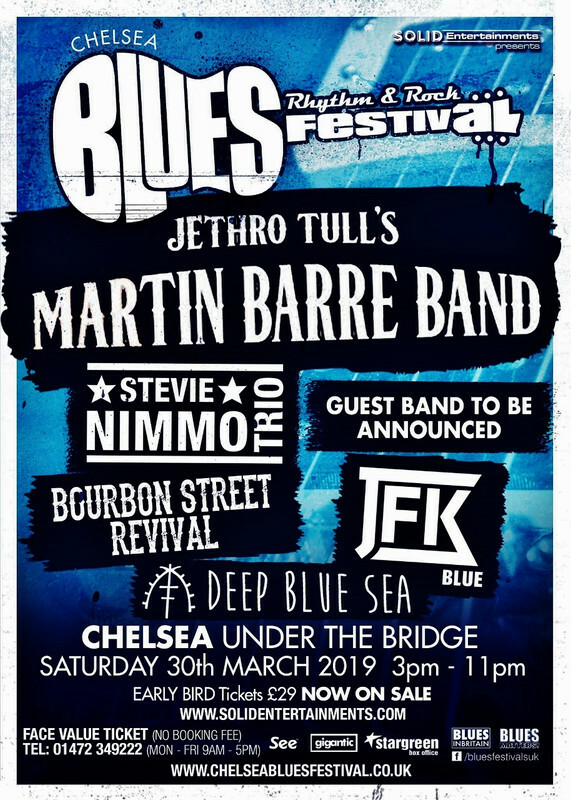 Next year will actually be the 50th anniversary... of Martin Barre in Jethro Tull, so it's legit! I think when there was no video of Martin played at the Jethro Tull 50th., it said it all I think it would have been a nice gesture but, I'm thinking the rift between Ian and Martin goes very deep which is sad for all of us Tull fans who love them both. 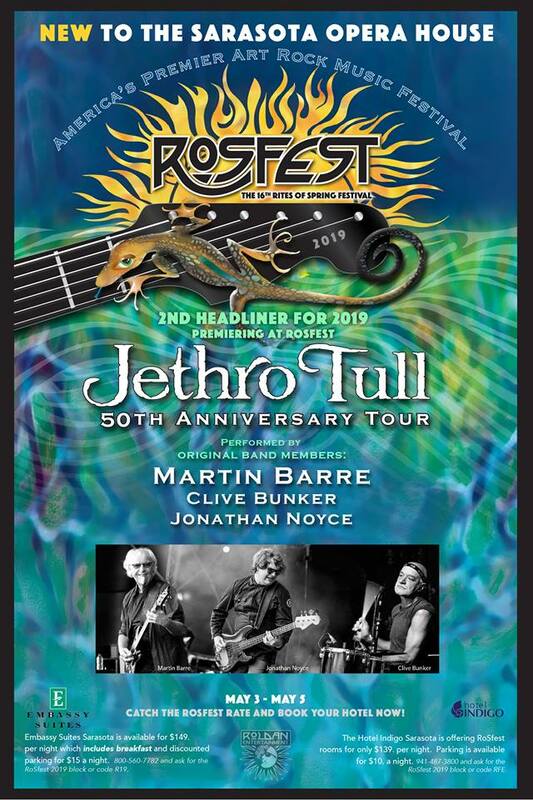 It's more likely the promoter who described it as such on the flyer but I would have hoped that in 2019 Martin would be taking his new album on the road with just a smattering of Tull songs. 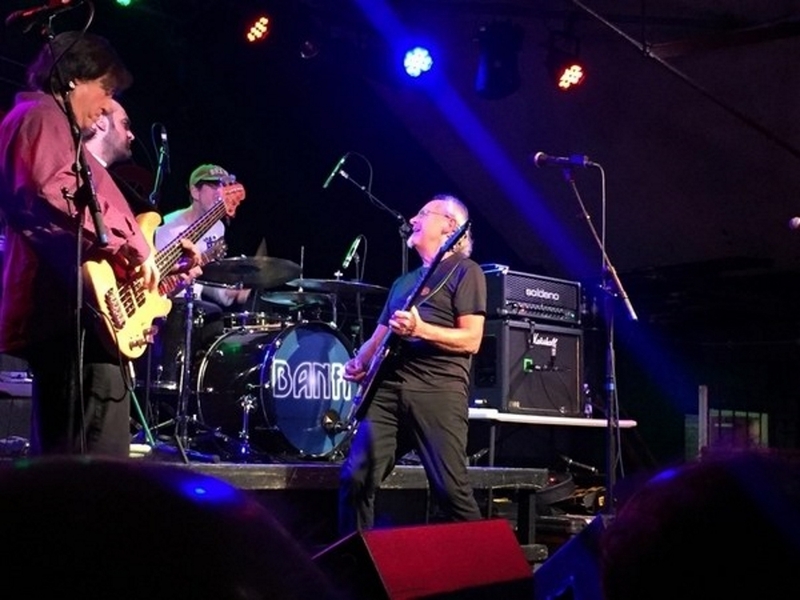 Martin Barre "Very excited to be announcing a NEW TOUR for 2019!" Now I wonder which version of Martin's band I get next Spring...Of course, I will be happy with either. It's great that Martin has gotten more alum involved and will clearly be doing some very Tull-centric sets. I'm not too concerned about the ads...real Tull fans know what's what in Tull world and how to read the ads...and anyone who shows up without understanding exactly who is coming to play what version of Tull....will nevertheless see something great. Tupelo Music Hall Derry NH 4/19. Nice find bongo Wish I could go. Hi all. I got tickets to the following and was wondering if Martin has performed an acoustic concert before? Do you think this will be all acoustic given the name? Saw him last year in Lancaster, Calif with whole band and it was very good. Concert is listed on his website. The info below is from the venue. Martin Barre has been the guitarist of Jethro Tull for 43 years. 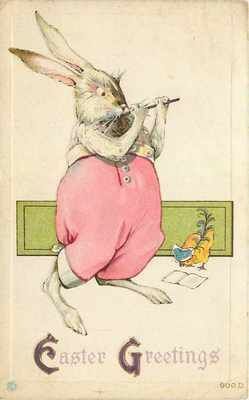 His sound and playing is a core element to the sound of Jethro Tull. Looks to me like Spring of 2019 is going to be a big Martin Barre fest here in California. I can't wait ! Thanks for the link. Found the info, so looks like we will be seeing a modified version of the show then. My wife will like that, it will be quieter It will be interesting to hear the songs in an acoustic version. The venue is very small, 150 people max. So will be a good concert in a small setting. It is the closest to the Orange County area where I live. Looks like this concert is just before his Stand Up America shows begin. Hopefully Martin will return to our area and do those shows too. 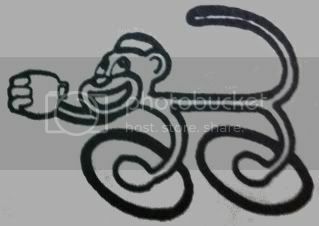 Appreciate all the info on the forum here. 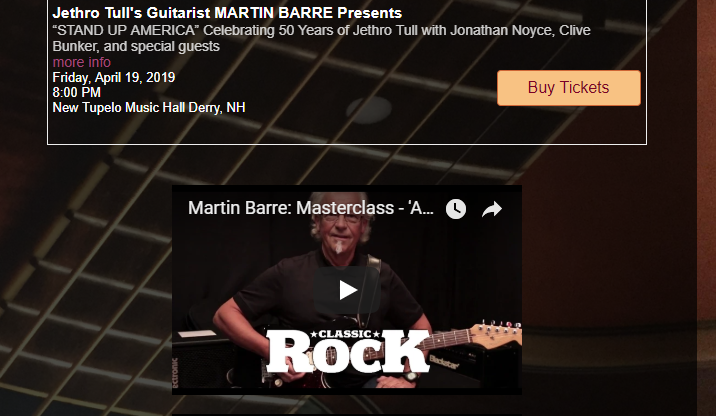 . . . . Martin Barre has been the guitarist of Jethro Tull for 43 years, his sound and playing having been a major factor in their success. Album sales have exceeded 60 million units and they continue to be played worldwide, representing classic rock history. Barre performs Saturday, April 27, at 8 p.m., at The Newton Theatre. Tickets are $44-$59. Barre's guitar playing has earned him a high level of respect and recognition; he was voted 25th best solo ever in the USA and 20th best solo ever in the UK for his playing on "Aqualung." His playing on the album "Crest of a Knave" helped earn the band a Grammy Award in 1988. Barre has worked with Paul McCartney, Phil Collins, Gary Moore, Joe Bonamassa and Chris Thompson, and has shared a stage with such legends as Jimi Hendrix, Fleetwood Mac, Pink Floyd and Led Zeppelin. Fairport themselves will open the festival on the Thursday with an acoustic show, and will be the closing headliners on the Saturday with a two-hour set. 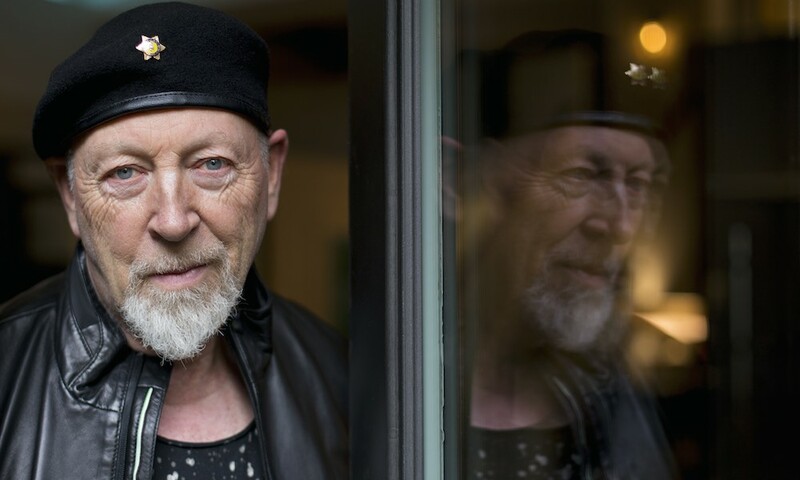 Richard Thompson, Caravan and the Waterboys are among the major names to be confirmed for the 2019 edition of folk mainstays Fairport Convention’s much-loved annual, three-day Cropredy Festival next summer. The event celebrates its 40th anniversary next year, and will take place from Thursday 8 to Saturday 10 August. Fairport themselves will open the festival on the Thursday with an acoustic show, and will be the closing headliners on the Saturday with a two-hour set. The Waterboys will headline on Thursday, while Thompson is set for one of Cropredy’s trademark reunions when he performs with his former Fairport colleagues Dave Mattacks, Dave Pegg and Simon Nicol. The bill features both first-time performers at Cropredy and returning favourites, with award-winning acoustic guitarist Martin Simpson and Canterbury progressive giants Caravan among those due to make their debuts in 2019. Seth Lakeman returns to the event after a ten-year absence, fresh from a world tour with Robert Plant, and Jethro Tull guitarist Martin Barre will mark 50 years of the band’s music with original Tull drummer Clive Bunker and former basst Jonathan Noyce. Cropredy logoAlso on the bill for Cropredy 2019 are Zal Cleminson’s /sin’dogs/, fronted by the former guitarist with the Sensational Alex Harvey Band. Daphne’s Flight feature the distinguished singer-songwriters Christine Collister, Melanie Harrold, Julie Matthews, Helen Watson and Chris While, all of whom well-respected artists in their own right. Long-standing singer-guitarist Richard Digance will play his customary Saturday lunchtime slot. The initial list of 2019 performers is completed by harmonica/accordion duo Will Pound and Eddy Jay; Wildwood Kin, the female trio who were the winners of the Bob Harris Emerging Artist title at the 2017 UK Americana Awards; multi-instrumentalist Lil Jim and the four-piece Tide Lines. Tickets for Fairport’s Cropredy Festival 2019 are on sale now, and all of the box office details are at www.fairportconvention.com. Well, that sounds right now. I got tickets to his acoustic show on March 7 in Carlsbad, CA. Of course, then announced he was playing in Laguna Beach on March 8th. I assume it will be the whole band doing electric this time. Not advertised as acoustic as of yet. So excited hopefully to see both shows since they will be different atmospheres seeing him. Since I am in South Orange County, Laguna show is about 10-15 minutes from our house. Also picked up tickets to Ian's concert in Irvine on July 9th. It will probably be my last time to see him as not sure I can handle his voice anymore. The music hopefully will be great though I hope. First concert I saw them was 1973 and many in between then and now. In 2019 will be seeing quite a few it looks like. Looking forward to them. The price I paid for Ian's concert, I could see Martin about 3 times Martin's concerts are a real deal!!! In addition to his work with prog rock icons Jethro Tull, the Birmingham star has also collaborated with artists such as Paul McCartney, Phil Collins, Gary Moore, Jo Bonamassa and Chris Thompson, and has shared a stage with legends including Jimi Hendrix, Fleetwood Mac, Pink Floyd and Led Zeppelin. Songs the Kings Heath star is best known for include Aqualung, Locomotive Breath, Cross Eyed Mary, and Teacher - songs you'll surely hear when his solo show comes to Bilston's Robin 2 on January 23.